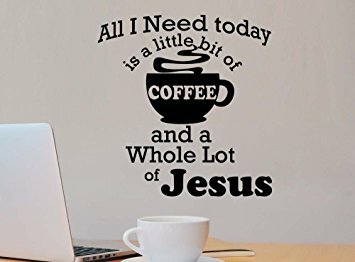 Saw this on a cup this morning — “All I Need Is A Little Bit of Coffee And A Whole Lot Of Jesus” and I’m totally relating about now! Earlier this morning, my beloved Blackberry screen gave me the boot. I’m constantly teased about having a Blackberry…’do they still make Blackberry?’, ‘so do you like have a fax machine too?’. I don’t even trip when people tease me, I figure that, if I’m going to put money out for a smartphone, then it WILL be the kind of device I want. Blackberry girl por vida. Some might say that I’m terca, and resistant to change LOL. I honestly do not remember the last time that I was without a phone. In radio, I always had use of phones provided by the company, for my past events, I’d activate a Metro batphone so that I wouldn’t mix my projects up. Not the case now and I’ll likely be without a phone for the next couple of days. Me, who conducts the majority of my business on that Blackberry from my real oficina, my Jeep. I actually had to ‘serenarme/calm the eff down‘ when I realized that, in order for the insurance I pay on the thing to kick in, that it wouldn’t be right away. I walked that parking lot starting to freak out in the crazyass wind almost ready to throw down the cash LOL. How am I going to live without my phone? When I got back on the road and literally saw traffic in every direction of the freeway, I decided that I didn’t need to deal with that mess and got off of the roadway. I also decided that I needed to see the ‘lado amable’ of the situation…getting myself out of the day-to-day grind and back into my positive frame of mind at my favorite happy place: Writing. Listening to Music. Writing. Inhaling the smell of coffee. Writing. Calming down. Writing. Getting Inspired. Writing. Feeling grateful. Writing. Getting my prayer on. Writing. Realizing that not only Jesus, but God and the Virgen of G, have my back and that everything will be alright. Disconnecting from the phone, Blackberry, email, social media is a good thing, a great thing. That is, unless I go straight to the real ‘DT’s’. Posted on May 23, 2018 by ctorres716Posted in 52EssaysNextWave, Blogging, InnerChingona, Musica, Sense of Aventada-ness, SonsaTontaPendeja, The Power Of Writing, What?QueQUE?, Y ahora que?Tagged Blackberry, Calm Down, InnerChingona, Si Se Puede!, Terca.